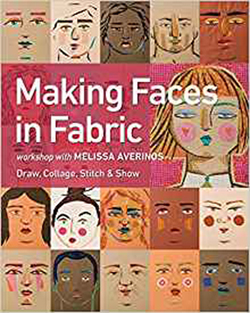 Discover how to create freeform, raw-edge appliqué faces using Melissa Averinos' workshop-based book. Melissa walks you through the process step-by step, from a comprehensive lesson on drawing the face, to translating your sketch into fabric, to stabilising the piece with stitching, to incorporating your stylised face into a finished project, whether it's a cushion, bag, shirt or stretched canvas. Learn how to make a variety of eyes, noses, lips, hair, and face shapes, as well as how to create facial features in just the right proportions. You'll be amazed by how much the final portrait resembles your subject.